This is the third time that the Manila Concert Choir has performed in Laoag City. I was able to watch their previous performance and they continue to amaze their audience with their wonderful music. The Manila Concert Choir has been established in 1951 and its membership is based on invitation basis. This group is composed of people from different disciplines and of various ages. 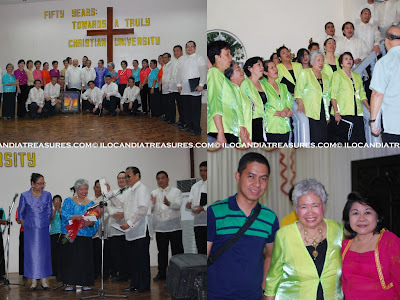 It is headed by Prof. Leonor Briones of the University of the Philippines who was a former National Treasurer. The conductor of the group is Dr. Romulo Pizana, a mathematics professor at Far Eastern University. Dr. Ceasar Agnir, president of Northern Christian College has been the sponsor of this concert and made it free of charge for the audience. He wanted to share to the community the beautiful music and be able to make people appreciate and enjoy musical concerts. A day before their concert, I was invited by Atty. Amor Respicio to join the group for a dinner as she hosted it in her house. After dinner, the group positioned themselves at the staircase and sang few pieces from their repertoire. 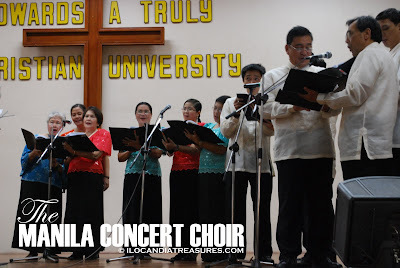 On the concert, they sang Christian music, songs for the love of country, music from South Pacific and Ilocano songs. One of the songs that they beautifully interpreted is the patriotic song Sabihin mo Ikaw ay Filipino which was originally sung by the Smokey Mountain and composed by Ryan Cayabyab.